Northern Michigan Beer: Stouts and porters. The nomenclature itself invokes rough and tumble proletarian origins as these dark, unfiltered beers, so achieved by roasting the malt, were heartier, higher in alcohol and therefore the favored slug of English and Irish working folk. While the democratic spirit of the beer endures, our Northern Michigan crafted stouts, made from Ludington to Traverse City, are not mere means to a buzz but manifold beverages with malty layers of caramel, roasted coffee and cocoa notes and a diversity of textures ranging from creamy near-sweetness to intriguing bitterness. Pair them with spicy Southeast Asian curries and chocolate desserts. Read on as we hoist the heavy pint and savor some of North Michigan’s great black brews. Jolly Pumpkin, 13512 Peninsula Dr., Old Mission, 231.223.4333Madrugada Obscura: This Belgian-inspired stout is fermented with wild yeast and barrel-aged to show complex roasted malt and coffee flavors and bitter hops, to produce a rich, dry mouth feel. Nitro Stout: Applying the nitrogen tap to Jamesport’s Dry Stout imparts a smooth creaminess and accentuates caramel andmocha flavors. Right Brain Brewery, 221 Garland St., Traverse City, 231.944.1239Naughty Girl Stout and/or Portly Blueberry Chocolate Stout: The dark beer genius of Right Brain doesn’t sit still for very long, but catch either of these if you can, one darkly bitter but dangerously smooth, the other like a delicious malty truffle. North Peak, 400K W. Front St., Traverse City, 231.941.7325Mission Point Porter: A certified mouthful with rich chocolate character and the right measure of hoppiness. An accomplice to his English father’s home brewing efforts at the age of 13, Mike Hall took up brewing in college and wound up a certified Master Brewer. 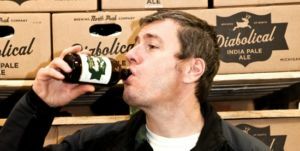 After 54 breweries and 15 years training some of the best young talent in the beer biz, Mike hangs his hat on the Old Mission Peninsula near Traverse City. As a brewer, what’s the intrigue of stouts?Maybe it started with my Irish grandmother giving me Guinness and milk. Beyond that the intrigue is in their subtlety and complexity of flavor. You get great nuance from the roasted malts and a mouth feel that’s determined by the profile of the water and the method of carbonation. We can add oats or lactose to smoothen the beer. Stouts provide a subtle baseline to build a huge range of flavors. Go for Indian or Thai. The interplay of sweetness and heat works well against the bitterness of dark malts. The thick mouth feel of stouts and porters also coats your tongue to suppress heat and draws out the subtleties in the food. Chocolate and imperial stouts go great with dessert, especially chocolate.